Tweet There are two albums coming out mid September that I’m dying to share with you. One is guitar legend Leslie West’s solo album and the other is Eric Sardinas and Big Motor’s fifth effort “Sticks and Stones.” It’s authentic blues and rock n roll. There are some great songs on the album, but this isn’t the album review. Recently Eric Sardinas played a concert in my backyard…by backyard I mean an establishment about two blocks away from my house called Rascals Moline. I hopped on over there and chatted with Mr. Sardinas. Zoiks! : When is your album “Sticks and Stones” coming out? 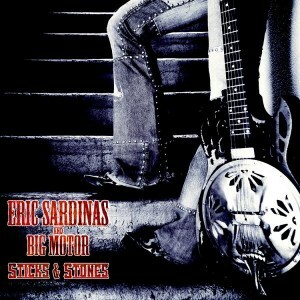 Eric Sardinas: It’s coming out on the 13th. It was supposed to be released on the 30th, but there was some sort of hitch with the printing, some stuff ending up bleeding or something like that, so anyway lucky 13. Z! : How would you describe the new album? ES: I’m actually happy to say it’s very capturing. It really does capture the energy of the band and of the music. That was a goal and it’s always something you need to be concerned about, for me especially. Being a live band as much as we are, taking the music into the studio you can lose that energy, that energy can sterilize really fast. We really had a nice energy inside of the studio and we brought the songs to where I really expected them to go. I was really excited about the songs in general, and so to bring those songs as individual pieces to where they needed to be we had to make sure that that energy flowed, and so we captured it. I think that it’s an energetic album and it really portrays where we’re at today. Z! : How many albums is this? ES: It’s actually my fifth. Z! : How was the writing and recording process different this time around? ES: I think that each album is kind of like a stepping-stone just in general for me. I’m in a different place and at a different point both musically and lyrically. I try to push those energies with each recording to move forward, and I think that the thing that makes it different in the last album is that I moved it forward for myself. Z! : How are the new songs translating live? ES: Pretty honestly. We never play the same song the same way twice. There’s a structure and there’s an energy to that, and there’s a lot of freedom in a live show that we do. That’s the way I like to harness it. It’s really about the song, but it’s also the freedom of where that song can take you. Z! : Is there a song that gets the best reaction from the crowd? ES: I think there’s a flow of nuance that I like to interject in a live show. I like to take it down to the strip down acoustic delta style, acoustic Texas style blues, and I like to also bring it all the way to a place that borderlines between the blues and the rock and turn it sideways. It’s really about a ride for the listener. Z! : What’s your favorite song to play? What’s the most fun song to play? ES: Fun song, huh? I think they’re all fun. To be honest with you I’m like a little kid up there. Z! : What can people expect from your live show? ES: I like to think of it as a musical experience. If you love your live music, if you love blues, you like rock, the rock and roll, and you like to have a good time, it’s really about getting in touch with everything that matters and forgetting about everything that doesn’t for a little while. I have a song for everything I’ve ever been through, the good the bad, and I think we all do. The ups and downs and there’s memories in every one of them. Music really is a pulse point for me, and I think it’s that energy when people come together, it’s a place for everyone to cut loose and be free. Z! : Do you remember when music was first introduced into your life? ES: Oh absolutely. I grew up listening to blues and gospel and Motown, soul, and rock and roll. Music was always being played at my house. My first concert was Elvis. I saw Elvis when I was six. I had music in my life at an early age. Z! : How was that first concert? How did that experience affect your life? ES: It affected it a great deal. For something you’ve had since your memory was there, to have music and to know who Ray Charles was and who Elvis Presley was and to be there in that concert situation as a young boy, it’s like anything else. It’s like seeing the blue’s greats. Those opportunities were of the times and a moment and I remember it like yesterday. Z! : Where did your playing style come from? ES: It’s a little bit of a blend. Coming full circle with the music that I was telling you that I was exposed to, that really is what generated me being interested in being musical in the first place. I think that through listening to rhythm and blues and gospel and Motown, and hearing rock and roll, and having an older brother listening to Boston and Kiss, Johnny Winters, ZZ-Top, I’m listening to Zeppelin there and then I’m going downstairs and listening to Moody Blue from Elvis or Ray Charles. I think all those things kind of came together and made the road. Z! : Who are some of the artists you’re listening to today? ES: You know what? The same ones I’m talking about. I love all kinds of music, but I really focus on the musicians and the music that have something to say and are moving it forward, and that’s really all the people that we know in the train of recorded music. Everyone has something to say, and those people that I bring up are just the people that we know, but there’s so many people in between. It’s like this endless well of pure energy. Z! : What keeps it going, cuz I gotta imagine it’s hard, that 2 hours up on stage has got to be amazing, but the 3 days on the road getting there has got to be tedious. What keeps you going? ES: Since about 8 years before I was signed in ’99, and since then, I’ve been on the road for 250 nights a year, plus. I’m all about making music. My worst day doing what I love would be my best day doing anything else. My energy is actually very circular. When I’m finished with a show I’ve given everything I have, and I’ve also received as much energy as I’ve given and the next day I’m recharged. Z! : I don’t want to call them guilty pleasures, but is there anybody that you’re into that your fans might be surprised that you’re into, artist wise? ES: I don’t know about that. I have my ears open to everything. I love rock. I love metal. I love the Beastie Boys. I just listen to good music, and anybody who moves anything forward. I can also talk about which generation from the ‘20s and ‘30s from Robert Johnson Sun House, Barbecue Bob, Foot McDowell to the ‘30s and ‘40s with T-bone Walker. I can move it all up and talk about all those different energies. I just love real music, that’s what I love. Z! : As a guitar player, how often do you get to play? Do you get to play daily? Is there ever a day that you don’t play guitar? ES: Being out on the road as much as we are, my guitar and I are pretty much inseparable. When I get back and get off the road it’s pretty much in between a tour, just enough time to use a big bar of soap, and wash up and be able to see your mama and daddy and get back on the road. That’s really the couple of times I may not be playing the guitar that day. Z! : What’s your proudest achievement so far? ES: That I’m still here. That I’m able to still do it, and I have a record that I’m proud of, and I feel like I have more to say.